Notes: I took this of my friend, Lt. Robert Voshelle, commander of Company B, 28th Division of the 111th Infantry, as they were marching from their quarters at the Chester Armory to participate in activities at Pennsylvania Military College. The picture was taken from the corner of 15th and Walnut Streets looking towards Providence Avenue. Bob Voshelle spent a career as commander of Company B, retiring as Captain. 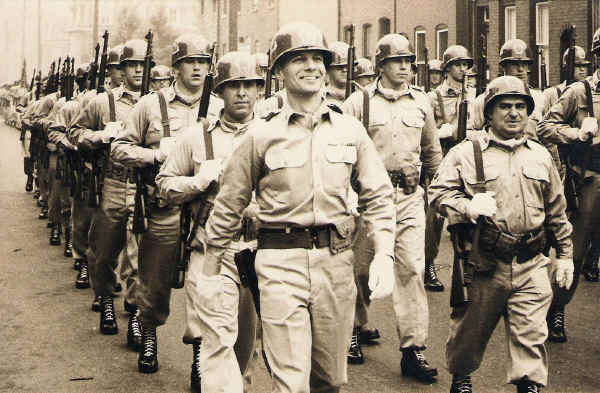 The Sargeant in the right front of the company photo is named Benny Lewinski. © 2003, 2004, 2005 John A. Bullock III.